Hoof Wraps Brand Soaker makes soaking treatments easy for both you and your horse! If your horse doesn't stand still while you are using buckets and soaking treatments - the HoofWraps Equine Soaker will make the whole process a lot less stressful! The Hoof Wraps Soaker is a must for every first aid kit. 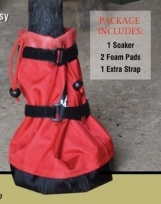 If your horse doesn't stand still while you are using buckets and soaking treatments - the HoofWraps Equine Soaker will make the whole process a lot less stressful!Hoof Wraps soakers are made with a thick shell of ballistic nylon and a coated nylon liner. Each Soaker comes with two EVA foam pads and an extra strap. We also sell the extremely popular HoofWraps Equine Bandage which is strong enough for use when your horse is turned out. Many people also take the HoofWraps Equine Bandage along with them as a back-stop boot or shoe replacer!